“Why are you asking about Ultron?” He asked. 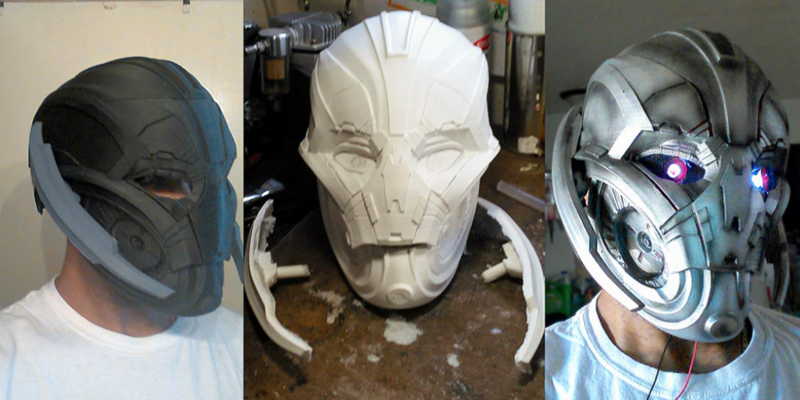 I explained my role as intrepid reporter for the hard-hitting 3DPrint.com and our interest in the story since Brooklyn based cosplay artist and owner of Hero Complex Props, Michael Ruddy, used his gMax 1.5 XT 3D to print a wearable, life size Ultron helmet. “Oh.” They said and explained to me exactly who Ultron is. Meanwhile, the burned out bulb creating the shadowed area had been replaced and it turned out I was talking to one of the extremely elite groups of people who had seen the movie Age of Ultron, which opened outside of North America setting enormous opening weekend records before being released today in 4,247 theaters across the continent. It turns out, Ultron is the super villain against whom the Avengers have been fighting. Only, he’s not a person, he’s a robot, but his dad is a person, and there isn’t just one of him. Or maybe there is. The end results being that people who like, or admiringly hate him seem to get a glow in their eyes whenever I ask about him, which was particularly appropriate given that the 3D printed mask has two LED lights that make the eyes actually glow. My secret informant, whose name may or may not have been Steven, gave me the secret code for getting more information from Acme Comics, located a couple of doors down. It was complicated, but I repeated the passcode and luckily the folks behind the counter at Acme immediately knew why I had come. Jermaine Exum, Acme Comics store manager patiently explained that this kind of mask is the sort of thing that people would wear as part of Cosplay (short for costume play) in which they assume the role and persona of favorite characters. Exum wasn’t all surprised to learn that a mask had been 3D printed out of PLA by and for cosplayers. To him, the possibilities of creating personalized props that transform the wearer from regular Joe to Avengers archenemy is just par for the course. In that sense, it seems that the comic book and cosplay community are somewhat open source, a perfect fit for the culture of 3D printing. The ability of 3D prints to create fantastic geometries and integrate mechanical and computerized components make it an ideal playground for bringing the fantastical appearance of these characters out of the pages of the comic and into life.